What does your smile say about you? Your smile can reveal your warm, sunny personality or your bright and clever wit. It can also reveal serious medical issues that indicate further testing is in order. Plaque, which builds on teeth after meals or snacks, contains bacteria and toxins and causes an inflammatory response that can increase the risk of serious chronic systemic health conditions. The mouth can be considered a gateway to the rest of the body, and scientists have established a link between poor oral health and poor overall health. The bacteria in your mouth can enter your bloodstream through inflamed, irritated gums and quickly travel throughout your body where they can promote inflammation in the blood vessels, which increases your risk of cardiovascular disease. Gum disease has also been linked to diabetes, osteoporosis, respiratory infections and pregnancy complications. Chronic bad breath can indicate not just gum disease but also diabetes, acid reflux disease, kidney disease or liver problems. Chronic dry mouth may be caused by medications and can increase your risk of certain dental problems, but it can be alleviated by chewing sugar-free gum, sucking on sugar-free candies or drinking plenty of water. 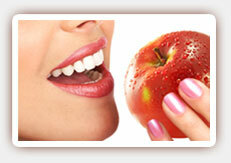 Good dental hygiene is one of the best ways to maintain good dental health and prevent most common dental problems. Brush your teeth after meals or at least twice daily, and floss daily. Your gums should be pink, firm and hug your teeth closely. Gums that are spongy, inflamed, receding or bleed easily may be infected and should be evaluated by Dr. Ghasri, West Hollywood dentist. Give us a call today to schedule your consultation.